Silvio Smalun performs his Technical Program at the 2003 European Figure Skating Championships. Germany’s two-time national men’s champion, Silvio Smalun, who just turned 24, is just hitting his stride as an international competitor. After beating both Andrejs Vlascenko and Stefan Lindemann at German Nationals this year, he finished 11th in his second European Championships, ahead of Lindemann. “This season, I just hope to perform well and qualify for Worlds,” he noted. 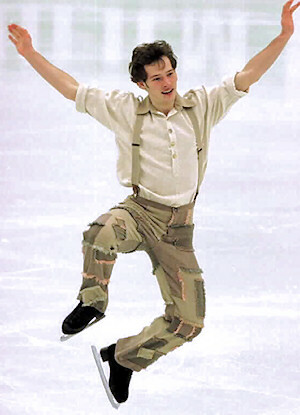 “I didn’t try dance or pairs since I was good enough to do singles,” he said. “I landed my first triple when I was 12. It was a triple toe loop, but my favorite jump is the flip. I’ve been practicing a quad toe and landed about half of them since December so I’ll be using it in the short and the long as a quad toe/double toe combination.” This season, Smalun landed seven triples in his long program at German Nationals, a personal best. “I want to compete at the Olympics in 2006,” Smalun stated. “I’m still developing and I want to skate until I feel like I’m going back, then I’ll stop.” Smalun doesn’t plan to coach. He tried the German Army’s sports program for 16 months, but decided it wasn’t for him. “I needed something for my mind,” he explained. “It was boring.” So he began courses in computer science. He’s in his second year of studies, taking classes part-time, and hopes to finish in four to six years.